#ParentingAndUs - How To Make The Kids Express Themselves At Every Age? - Shopping, Style and Us Shopping, Style and Us: #ParentingAndUs - How To Make The Kids Express Themselves At Every Age? 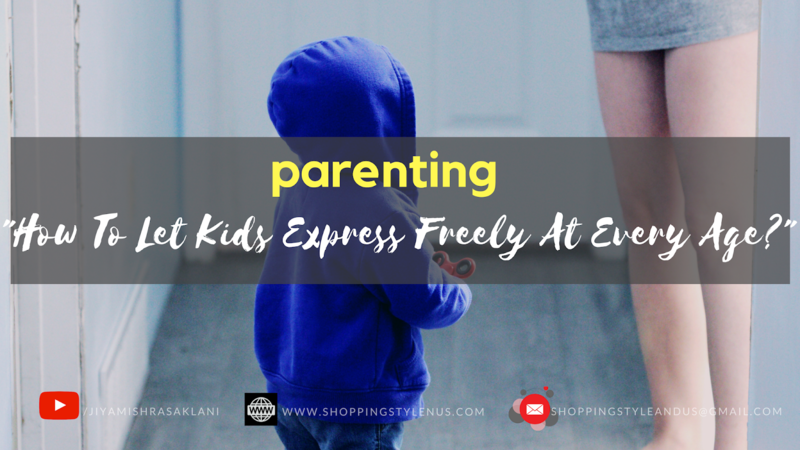 Home / Kids / Lifestyle / Menta Health of Kids / Parenting / Self-Improvement / Slider / #ParentingAndUs - How To Make The Kids Express Themselves At Every Age? Ever seen a difference, where kids of one family were submissive, stubborn or shy while the kids of other family were confident, speak their minds and take decisions instantly? This is probably why! Before that let me tell you a story! There were two families and both families had a girl and a boy of the same age group. Both groups of kids met regularly, grew-up together and went on to become successful in their lives in their own ways. However, there was one underlying thing visible in their demeanour - the kind of parents they had. The kids of family A learned everything with the age but they were not very open with their parents. They were expressing their affection, concerns etc. openly but they couldn't speak their feelings to their parents. On the other hand, the kids of family B grew-up and settled down in their lives, although, their careers had stalled unlike the kids of family A, yet they had this visible confidence in them. It was because the kids of family A were either mocked, were made feel little or simply were not trusted for how they felt by their parents. Their parents were only doing it out of love, frustration or simply the way they were treated in their childhood. The kids of family-B were also made fun of for expressing their feelings, but the parents listened to their kids and they let them speak. Listen to anything your children wants to tell you. If you don't listen to the small stuff now, they won't tell you the big stuff later. This stirred some emotions in me. I was thinking about the difference between the kids of those two families. It suddenly hit me how I was treating my child. I realised that the way my husband and I were treating our child with material things is a lot different than how we were treated. However, we were treating her emotionally exactly the same way how we were treated in our childhood by our parents. The reason is that our subconscious is trained to handle a parent-child bond only the way we had experienced, and we never made an effort to change the experience. And I was shaken! 1. I was softer with other kids, but very different and loud with my daughter. 2. I set high expectations on her like how she should behave with other kids, how she should play, etc. 3. When talking to friends and family, I gave them updates by saying how naughty she had become, how she was not listening to me etc. 4. I have raised hands on her out of pressure that she must behave properly, frustration for different reasons, or simply the fact that she did not listen to me when I repeated myself multiple times. 5. Although I had decided not to, I wanted her to study in a certain way , thus forcing my expectations on her. These 5 reasons are sufficient to prove that I am subconsciously treating my child the way I was treated. The result of all this is that my daughter has started hiding things, doing things and not telling me, getting jealous of other kids and becoming very dramatic if we support her or don't - either way. And I found the answer in the quote. we must let our child speak their minds and LISTEN to it! - I do really nice things for/with her and I know that make her feel good and strengthens our bond. - questions that I ask myself off and on, and it helps me connect the feelings of my heart with my mind. This helps me get the clarity before I talk to my daughter. - A tip by a friend which is simply amazing and I try that too! But more about these tips and tricks of parenting later! For now, let's try LISTENING to them. Tell me how you treat your child?